Horchata Treats for Cinco De Mayo! Happy Cinco de Mayo! 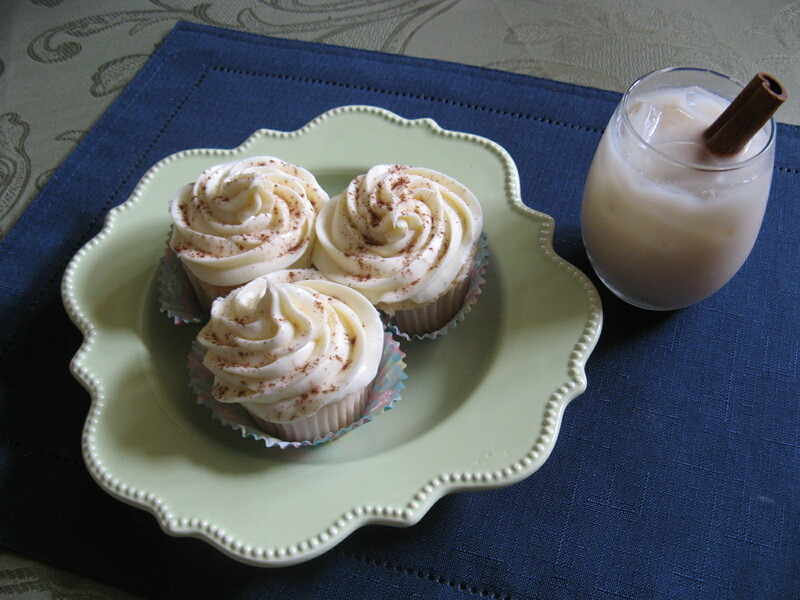 This year I decided to make Horchata in honor of the day and then use some of that fresh Horchata to make Horchata Cupcakes topped with Cream Cheese Frosting and sprinkled with cinnamon. After a few Google searches I decided to make my Horchata as close to “authentic” as possible. I found a recipe that used evaporated milk, one that used rice milk and another that suggested purchasing powdered Horchata mix and mixing it with milk. For authenticity I opted to go the traditional route of blending water with rice until the rice was broken down and then letting the mixture sit in the refrigerator overnight. The next day I strained the water to get all of the rice bits out and blended it with whole milk, vanilla extract, almond extract (okay, this was a bit of a shortcut since some Horchata recipes call for ground almonds), cinnamon and sugar. Yum! And then the next day I used the fresh Horchata to make cupcakes that were super moist and had a hint of the Horchata in them. Delish! Feliz Cinco De Mayo… May your guacamole be spicy, your margaritas strong and your food delicioso! In a blender combine the rice and water. Blend for about 1 to 2 minutes, until the rice has broken down but does not form a powder. Refrigerate the rice water mixture for at least 6 hours or overnight. Strain the rice mixture into a container through a fine mesh sieve or several layers of cheesecloth to remove the rice solids. Transfer the rice water to a blender and add in the milk, vanilla and almond extracts, cinnamon and sugar. Blend for a minute until all of the ingredients are well combines and smooth. Refrigerate if not serving immediately. When serving, pour over ice with cinnamon sticks as stirrers. Mix the Horchata, vanilla and cinnamon together, set aside. Add the flour mixture and the Horchata mixture to the butter mixture in 3 parts, alternating between the flour and Horchata mixture. Beginning and ending with the flour. Set aside. In a separate bowl, beat the egg whites until soft peaks form. Fold the egg whites in to the cupcake batter until incorporated. Scoop the batter into the prepared muffin pan and bake for about 20 minutes or until a cake tester comes out clean. Let the cupcakes cool in the pan for 5 minutes before transferring to a wire rack to cool completely. Beat the cream cheese and butter together until creamy. Add in the vanilla extract and continue beating, then gradually add in the confectioners’ sugar. If not using immediately, store in the refrigerator.